Gwenaël Kerléo, a Breton harpist and singer, was born in 1975 in Côte d’Ivoire (Africa), where she lived the first two years of her life. Back to Brest, in Brittany (France), she discovered the sound of the Celtic harp thanks to Alan Stivell’s albums, but also thanks to her first grade teacher, who one day brought her instrument in class. 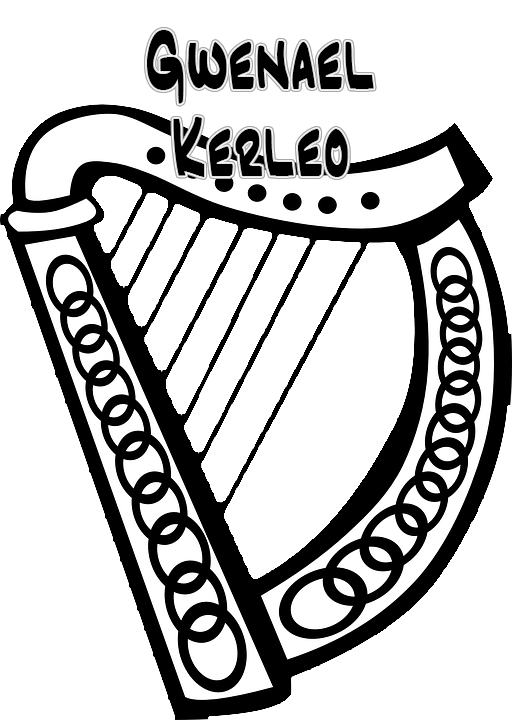 That is when Gwenaël Kerléo decided to start learning the Celtic harp. At the age of 9, she took her first lessons with Hervé Queffeléant (from the group Triskell). He taught her orally, leaving a lot of room to personal composition and improvisation. As she had a deep musical sensitivity, Gwenaël Kerléo applied for a special secondary school with specific schedules leaving much time for musical practise, where she was able to devote all her afternoons to the study of her instrument. She did so at Brest’s National School of Music, where she developed her skills with Muriel Chamard-Bois. There, she also began learning to play the piano, the violin, the accordion, the classcial harp and the Kora (African harp), not leaving aside her favourite, the Celtic harp, in the meantime. In 1992, Gwenaël Kerléo was awarded the First prize of the Music Conservatory, with first class honours. Still willing to improve her skills in playing the Celtic harp, she attended numerous sessions with Katrien Delavier, Kristen Noguès and Janett Harbison. With a friend of hers who played the violin, she formed the duet “An Delenn”, and represented Brittany in Paris for the finals of the “Musical Youths of France”. After passing her high school diploma in science, Gwenaël Kerléo attended a nursing school and obtained her degree. She then went on to university, studying psychology (BA) in order to specialize in music therapy. However, she never worked in that field, choosing instead to devote herself entirely to the study and practise of her instrument. Nurtured on traditional tunes from Brittany and Ireland, and possessing a solid musical knowledge, the young harpist quickly decided to develop her own creations, and recorded her first compositions in 1994, together with traditional melodies. Two years later, in 1996, she released her first album, “Terre Celte” (“Celtic Land”), containing only her compositions. On the album, the Celtic harp was accompanied with a violin, a wooden transverse flute, and Scottish bagpapipes. “Terre Celte” recieved a warm welcome from the public and the press, and a programme on the artist was broadcast on France Musiques (national radio station). Eager to live yet new musical experiences, Gwenaël Kerléo contacted jazz musicians, and mixed the sound of her harp with the improvisations of the saxophone, the chromatic accordion, the guitar or the drums, and recorded a second album, “Chemins de Brume” (“misty paths”), which was released in 2000. Together with that album, concerts became more and more numerous and provided the young woman with more occasions to meet a larger public, and more particularly in Italy, where she played regularly. That album marked a turning point in her career, and prompted her to become a professional musician. Willing to manage her career by herself, she set up her own company of music production and entertainment. In 2003, while she was expecting her second child, Gwenaël Kerléo recorded her third album, “Yelen”. That album, displaying a great maturity, was organized as a full work for a single harp. With a moving intimacy, it was composed of three movements, each alternating slower and faster passages, where one could hear the young woman’s voice. Thanks to this work, greeted by the press as “the apotheosis of a great artist”, Gwenaël Kerléo gave more and more concerts abroad, in Germany, Hungary, but most of all in Russia where she played solo in the philarmonic concert halls of Perm, Ekaterinbourg, and Novosibirsk. In 2005, Gwenaël Kerléo started a collaboration with storyteller Jean-Marc Derouen, and featured with him in a show entitled “Chemins de femmes” (“women’s ways”). The two artitsts still currently provide various shows of storytelling for children and adults. She also initiated a duet with cellist Patrick Langot (who played in the famous Ensemble Matheus, a group nominated several times for the French Music Awards), and adapted her album “Yelen” for a harp and cello duet. In addition, she started learning the Breton language in an intensive 6-month course. After the birth of her third child, the artist increased her musical experiences, and played with some of the most promising musicians of the new Breton scene: Loig Troël (accordion), Yvon Molard (drums), Kevin Camus (uilleann pipe), Shane Lestideau (violin), Franck Fagon (clarinet) and Yann Queffeleant (guitar). Her fourth album, “Pevar”, was released in 2009. It shed a brand new light on the young woman’s world. Indeed, with that album, Gwenaël Kerléo was no longer exclusively a harpist, but also a Breton singer. She was invited in Tokyo to celebrate Saint Yves day (patron saint of Brittany), by the association of Breton people in Tokyo, and played in larger music groups in Brittany, at the Festival de Cornouaille in Quimper, and the Vieilles Charrues in Carhaix. In 2010, the artist celebrated her 15 years of practise, and for that occasion, she relased the album “retour en Terre Celte” (“Return to Celtic Land”) for which the best parts of her first alubums were selected. Still highly demanded abroad, she played again in Russi, Slovakia and Poland, and did some featurings for Canadian and Italian compilations. As she was more renowned for her instrumental creations, Gwenaël Kerléo took up the challeng of producing an album exclusively with songs. Not being a writer, however, she collaborated with authors Serge Cabon and Jean Pierre Kermarrec for lyris in French, Louis-Jacques Suignard and Gareth Harris for lyrics in Breton and in English. These collaborations resulted in the recording of the alubum “Quai n°7” (“Quay number seven”), featuring several musicians from “Pevar”: Kevin Camus (Uilleann pipes), Yvon Molard (drums), Yann Quefféléant (guitar) and new musicians too: Jérôme Le Tareau (wooden transverse flute) and Mathilde Chevrel (cello). The album was released in Spring 2012. That same year, the artist gave performances in Paraguay at the Mundial Del Arpa Festival, and in Belgium, at the Brussels harp Festival. In September 2012, Gwenaël Kerléo met two artists living in the Mounts of Arrée like her. The first one, Yann Cortella, is a drummer, bass player, programmer and keyboard player and an ex-member of the famous French group Indochine. He worked with Bashung , Higelin, Fontaine etc…. The second one was Marielle Hervé, a chorus singer who worked with international stars such as Robbie Williams, Phil Collins, George Benson, Johnny Hallyday, Cabrel, Pagny… She is also one of the composers of the famous musical “Le Roi Soleil”. Together, and with the help of Yann Hergoualc’h (an author in Breton language), they decided to create an album of electro-world music, quite different from Gwenaël Kerléo’s usual tunes. Even before the official release of the album, the group they had formed (ARNEO) gave performances on the main scene of the Interceltic Festival in Lorient, in Ploërmel (Imaginaires de Brocéliande), Bénodet (Butte du Fort), and Fouesnant ( L’Archipel concert hall). In 2014, Gwenaël Kerléo celebrated the 20th anniversary of her first album, “Tir Na Nog”, and hence of her career.